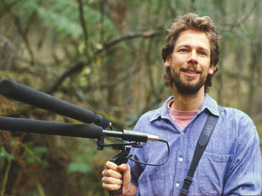 I have been recording nature sounds professionally since 1993. I recall that when I was about 10 years old, a friend and I went off to a local park armed with a cheap portable cassette recorder. We managed to record a Wattlebird screeching from a few yards away and returned with much excitement to listen to this distorted squawk lost amidst a sea of tape hiss. I can’t recall being inspired to a career by this experience, so I’ll put it down to one of the adventures of childhood. 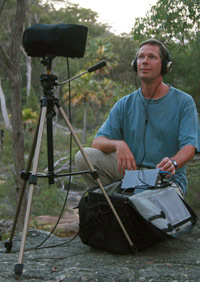 Often, when one thinks of nature recording, one envisages parabolic dishes or highly directional microphones. Here’s a picture of our friend Howard Plowright with his ‘big’ rig. Parabolas are designed to focus in on birdsong from a distance – sort of an audio equivalent of a telephoto lens. If you are researching the repertoire and dialect of birds and animals, this kind of equipment does a good job, recording a distant critter without the clutter of surrounding sounds. 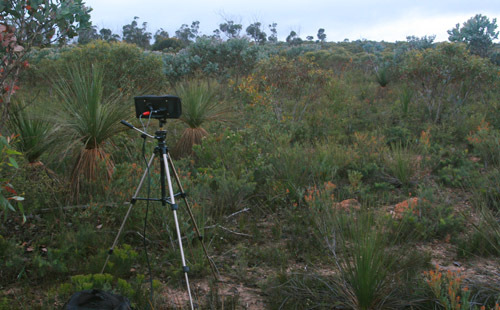 However, in our work, I am trying to record the whole landscape with each sound in a natural balance. I need a ‘wide-angle lens’ approach, and so my rig is quite different. When we first began recording nature sounds nearly 20 years ago, I inherited a pair of highly directional, shotgun microphones. While these actually worked quite well for our first projects, we realised quickly that their stereo field was too narrow for the soundscapes we wished to capture. So I soon graduated on to using wider-field microphones; the ones I chose were pair of Sennheiser MKH60s. I think of them as ‘sawn-off’ shotgun mics; still directional, but with a much wider pickup. They had a field of around 30 degrees each side, before muffling off-axis sounds. Thus a pair, deployed at an angle of around 60 degrees from each other, gave an optimal field of around 120 degrees, progressively muting as sounds came from the side or rear. This is similar to the field of view of the human eye, and was surprisingly good at giving a realistic stereo image. Most often I’d hand-hold these mics in pistol grips, which allowed me to ‘follow the action’ and compose the soundscape in the field to some extent. The disadvantage with this approach was the need to keep totally still and silent, and the limit to how long one could stand like that. I got pretty good at just meditatively standing, but was often relieved when the situation favoured tripod mounting. There came a day though, recording in India during our first trip there, that I realised I wanted to capture a much wider stereo field. The birdsong was all around me, the air pulsated with it, and I felt restricted by having to focus on particular sounds in the landscape. I wanted to be able to capture all of it, even if it was bit overwhelming at times. The system I chose to use is the SASS, or Stereo Ambient Sampling System. It is a quasi-binaural system, based on a microphone housing that is similar to the human head. It captures sounds from all directions, and presents them in a coherent stereo image. This is actually not so easy to do, for numerous reasons to do with the difference between how our ears hear sounds around us, and how a pair of microphones can actually record them. I have had the SASS modified to accommodate a pair of Sennheiser MKH20 microphones; premium, omni-directional mics that have a whisper quiet and fine-grained noise floor. They produce very little hiss, which is of course extremely important for quiet natural environments, and recording delicate sounds over long distances. Here are some photos of my SASS binaural microphone system. The sense of space that the SASS produces is absolutely lovely, and very realistic, especially when listened to on headphones (try it!). Because the SASS has a wide stereo field, it is not so important to anticipate where the action is coming from, or follow it, and hence the way of using this rig is always on a tripod. Often I will simply set up and walk away, which allows me to get on with other things (photography or checking nearby locations), and the wildlife to act more naturally around the mic than if I was there. I’ve even had a bird use the mic itself as a perch – listen here! When we began in 1993, DAT (digital audio tape) was an exciting option for quality field recording – pure digital; high resolution, no tape hiss, no analogue distortion… But DAT tape, like any tape format, is awkward. Think of mangled cassettes; only smaller and with far more terminal outcomes if the tape ever became jammed, stretched or crinkled. Thankfully, digital technology has advanced, and now there are a variety of hard disc audio recorders on the market. I use a Sound Devices 722, a professional, dedicated audio recorder. It is the most wonderful gadget; built like a brick, baby simple to use and functional in a wide range of climatic conditions. I often record to flash card to save on battery life, but the unit has an internal 40Gb hard drive to back up. Best of all, Sound Devices have a reputation for making the sweetest, quietest microphone pre-amplifiers in the business, so I just plug in the SASS, and I’m ready to record. When we’re back from a field trip, I simply connect the SD 722 into the computer, and transfer the raw audio files ready for editing – which is another huge advance on transferring tapes in real time. 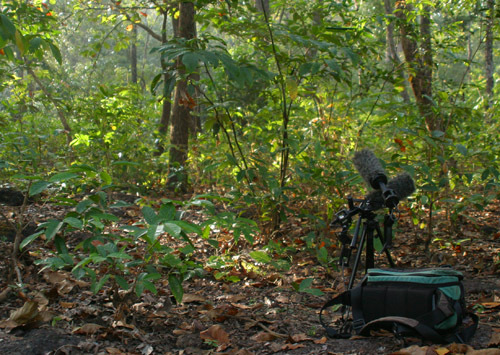 These technologies, including some very affordable budget gear, are opening up nature sound recording to an increasing number of amateur recordists. Which is wonderful, because obtaining technically good recordings is not the chore that it once was. What remains is the fieldcraft necessary to make great recordings, and I offer some thoughts on this here. 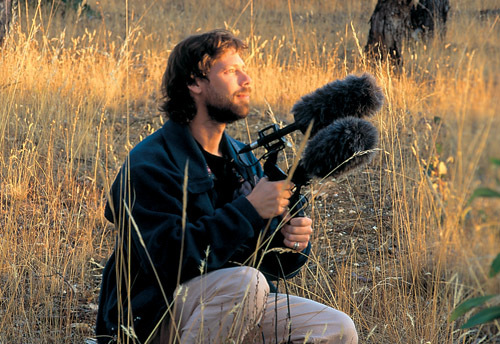 Established in 1993 by nature sound recordist Andrew Skeoch and photographer Sarah Koschak, Listening Earth offers a range of beautiful nature sound recordings from around the world. "Our albums feature only the sounds of nature as you would hear in the wild - no music or other distractions. Recorded in often remote and pristine locations, they bring you the relaxing and beautiful sounds of our living planet. Listen, and let our recordings take you there." Thanks for illustrating your setup a bit. I’m just getting into some amateur nature recording and it’s really nice to see how others are doing it, since it’s often a bit difficult to find this sort of information otherwise. Yes, thank you for posting this. While I have never made any recordings, I am an avid “audiophile” and have greatly enjoyed your recordings on my home and portable audio setups. (So has my parakeet/budgie! Who perks right up when I play any one of the recordings I have, especially “Happy Budgies”.) I was fascinated to read up on your recording technique. Great info and great recordings! Thanks a lot. 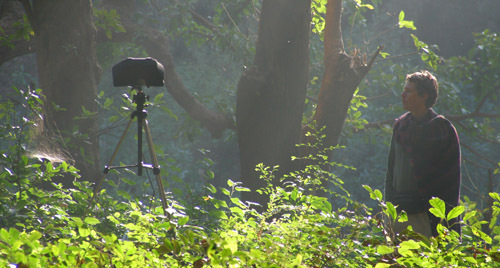 I do mostly bird recordings with a Telinga parabolic reflector, but I also record some soundscapes, although I have a rather poor equipment for that. I would like to follow your advice about the SASS. But I see in the Crown website that it comes with specific mics, is it worth buying the Sennheisers too?, is the Crown solution not good enough? Do you have any other slightly cheaper solution within the high quality range? Thanks so much! Question: in the very last line of your post you mention that you offer your thoughts “here” on the fieldcraft necessary to make great recordings but there’s no link or reference. Could you direct us to where those thoughts are? Thanks again. This is a huge help. Thanks for reminding me that I haven’t committed my thoughts on this issue yet!! Oops!! I’ll reflect on this a little and post something soon. Drop by in the near future, I’ll likely link it as a feature blog. Hi Andrew, I am a birdwatcher and I will soon be going in to doing fieldwork with birds. I am interested in acquiring data on specific bird vocalizations by using audio recording devices. My problem is that I don’t know what to search for online. 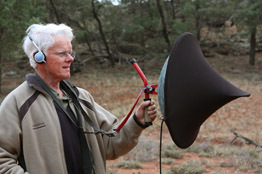 What I mean is that I don’t know what you call those specialised “wildlife recording” microphones. I think what I am looking for is something that is preferably hand held, not to big, and that will record specific sounds. Can you help me out please? And by the ways I love your work! Just looking at your site, and I am deeply impressed. Your interpretations of the sonograms and the evolved divisions of the frequencies between species is wonderful. Everywhere we look the complexities of relationships astounds. Much more interesting than single species recordings. Would love to hear your thoughts on fieldcraft. You have made amazing recordings! Way to go! You must be a really nutty person Andrew to run around in the outback with a silly sass and a seven twenty two. Don’t leave it sittin’ there alone or some nutty wallaby will pouch it and run. Hi, I really like your site. Am wondering if you have advice about recording on a mobile phone – external mics? apps? Any recommendations would be welcome. Hi Andrew & Sarah – Found your website and delighted to see what a wonderful life you both have following your passions and filling your life full of adventure. I spend a great deal of time in nature myself photographing the Canadian Landscape and would like to add another dimension to my work by recording the sounds that surround the moment of photographic capture. I have a one question regarding the Sennheiser MKH20 microphones set-up. Is the SASS housing that you use the Crown SASS-P MK II made by Harman? If so, did this unit come with inferior mics that you discarded to replace with the Sennheiser mics? You mentioned that you modified something, was this the case above. I greatly appreciate any advice you can give me on this topic as this is the final component to my system and can begin with beginners mind. (no experience as of yet!) Thanks again for your time. I am interested in acquiring a good quality but economical microphone to record bird songs. Not interested in getting a wide range of songs, but rather crisp and close bird songs I can use to teach to bird by ear. I was looking at a Sennheiser ME-66, I could spend $100 or $200 max in a microphone. Your advise would be appreciated. Listening Earth Blog © 2019 All Rights Reserved.